This is an odd one to quantify. It takes place at the same time as the King Leonidas and a force of 300 men tale on the Persians at Thermopylae, around 480 B.C. So it’s not a pre/sequel to the Gerard Butler hit that took comic book nerds by storm in 2006. Leonidas is killed in battle, and we gaze upon his corpse some time in to the new film. It’s the same time, a different place, and the same wars are being fought. We pick up at the Persian Army marching towards Athens and the other Greek cities intent on leveling them. Xerxes, a warrior God, emblazoned with gold chains attached to his body and washed in a golden glow oversees the action from an impossibly high parapet egging his men on to increasingly violent acts of war. The Persians dominate the region with a huge army and navy and weapons horde. Their ships are like concrete, able to withstand almost anything. The Greeks have the lock on spirit and brotherly love in a clear case of black and white. Both sides use slaves cruelly chained and pinned to their oars, for rowing. Greece has become a democracy with hopes for a better future for all, but its good intentions are no match for the Persians. Admiral Themistocles’s (Sullivan Stapleton) naval fleet is powerful but against Persia’s might, and the woman behind it, is tenuous. He must forge an alliance with Sparta, where Queen Gorgo (Lena Headey) is mourning the death of Leonidas and unwilling to help to see more loss of life. 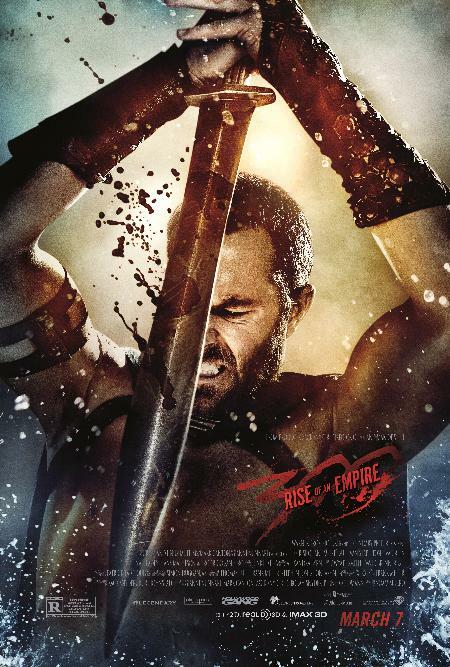 Sullivan Stapleton in 300: Rise of an Empire. Pic credit: Warner Bros. Meanwhile, Xerxes is the nominal head of Persia but Artemisia (Eva Green) is the real thing who gets her hands bloody as Xerxes watches from above, leading the navy from the front lines. She will have nothing less than total destruction of the Greeks. She is so deeply wicked and sadistic, so intent on instilling dread that she can chop off an enemy’s head and lift it and kiss it. This is a character we haven’t seen in films in recent memory driven by bloodlust and cold ambition, a 90 pound wrecking ball. Green’s go-for-broke performance will be noted and remembered. The battle scenes are remarkably unique and clever; there is a better narrative sense here than is usual for genre films. The scenes make sense within a kind of strange naturalism. Heroes die. Heavy losses on both sides and the seas are filled with ruined bodies. As expected the film is excessively violent, that’s its shtick, but thankfully the CGI gore and dismemberment looks a little artificial. Even so, violent mayhem is the name of the game so avoid the film if this sounds repugnant. Perhaps it suggests some kind of historical truths regarding warfare in ancient times and the sheer brutality of it. The barges, ships, weapons and locations are pretty astounding and the costuming is severe and beautiful and never over the top. The style and beauty of the original film carries on. In the midst of war and death the world represented in 300 is grand and majestic, glowing with gold, black, navy and grey, lit from within and always about to burst into storms and quakes. It’s a muscular fairy tale and its world design is important as any other element and as far from reality as it’s possible to get. Pure escapism. Ben Turner as General Artaphernes and Eva Green as Artemisia. Pic credit: Warner Bros.